Disclaimer: the web sites listed below may contain content that is incompatible with the America First Party's Principles and Platform. They are provided for their reference and educational value only. Ludwig von Mises Institute - This site promotes the economic writings of Ludwig von Mises, the premier scholar of the "Austrian School" of economics, which advocates free enterprise and opposes all forms of welfare and socialism. Mises promoted a libertarian economic perspective, and spent his entire life creating a devastating critique of planned economies and socialism. 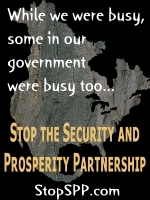 Stop the Security and Prosperity Partnership - This website is devoted to exposing and stopping the so-called "North American Union." Here you will find links to the primary documentation of the treason being planned by President George Bush and the duopoly to create a European Union-like superstate, in which the United States will surrender its sovereignty to a collective body based upon the interests of Canada, Mexico, and the globalists in our own country. Abolition of our borders, the creation of the "Amero" as the currency to displace the Dollar, and the overthrow of Constitutional liberties in favor of "collective human rights" are just some of the plans they have prepared for us. This website exposes it for all to see. Americans for Fair Taxation - Also known as FairTax.org, this organization is the primary promoter of the Fair Tax, a plan to abolish the income tax and the IRS and replace it with a national sales tax on the retail sale of goods and services. FairTax.org provides detailed information on the legislation which would implement this sales tax, as well as the comparative hidden costs of the income tax as a burden on production and prosperity in our society. Stop CAFTA Coalition - This website provides "An Activist's Guide to Stopping CAFTA", The so-called "Central America Free Trade Agreement." The site contains numerous white papers, news releases, coalition membership lists, petitions, and news relating to the fight against unfair "free trade" agreements foisted upon our country by the establishment parties. MinuteMan Project - This is the website for the Minuteman Project, a movement of citizens organized to guard the border of America and assist the Border Patrol officials in detecting and rebuffing illegal aliens coming into the country. KlanParenthood.com - This website makes the argument that the murder of the unborn is a racist enterprise, consistent with the racist roots of Planned Parenthood. The site quotes Margaret Sanger, founder of Planned Parenthood, about the urgency of culling out non-Caucasian elements in our society, and of using members of the clergy to advance that diabolical agenda. BlackBoxVoting.Org - This group is a publicly funded consumer protection organization for elections. BlackBoxVoting performs nonpartisan investigations and education efforts to discover defects in electronic and computer-based voting systems, and to alert the public and government officials of the dangers of non-paper ballot voting systems to the integrity of our elections. AmericanEconomicAlert.Org - Fighting For American Companies and American Jobs, AmericanEconomicAlert.org was founded by the U.S. Business and Industry Council Educational Foundation, dedicated to improving the American people's awareness of critical public policy issues in such diverse fields as trade, taxation, education, health care, foreign relations, defense, and national security. Jews for the Preservation of Firearms Ownership - "Before a government can become a full-blown tyranny, the government must first disarm its citizens. The Founders of this nation, from their own experience, knew that when government goes bad, liberty evaporates and people die ... unless the people are armed." Keep and Bear Arms - this coalition stands to fight for gun rights and the 2nd Amendment, especially opposing the extension of the "semi-automatic" weapon ban advocated by President Bush. The America First Party is the first political party to become a member of this coalition. Get US Out of the UN - this group opposes the United Nations, and educates the public on why the United States must withdraw from that internationalist locus of the New World Order. AntiWar.Com - The premier web site for opposition to American interventionism. If you oppose American Empire, you really should check this site out. HowToBuyAmerican.Com - Roger Simmermaker is the most widely known advocate of a "buy American" policy. He's also a leader in the America First Party. His new book, "How Americans Can Buy American" will show you how to shop patriotically. We The People - this organization sponsored the "Freedom Drive 2002", a march on our Nation's capitol by patriots from all across America demanding answers to grievances from our elected officials. The America First Party was represented at the rally. The government officials refused to answer the Petitions for Redress of Grievances which were presented by the assembled citizens.